ELIGIBILITY CRITERIA Brands included in the BrandZTM Top 100 Most Valuable Chinese Brands meet four..
Two portfolios of the BrandZTM Most Valuable Chinese Brands 2015 significantly outperformed the MSCI.. The value of market-driven brands in the BrandZTM Top 100 Most Valuable Chinese Brands increased 97 ..
Chinese brands have narrowed the gap. Consumers now see less difference between Chinese brands and m.. The BrandZTM Top 100 Most Valuable Chinese Brands 2015 marks the fifth anniversary of the BrandZTM C..
Total media spending is expected to reach ¥524.8 billion ($85.7 billion) in 2015, double the level.. Brand extension is becoming more prevalent in China as the market and consumers evolve and brands se..
Technology and retail – categories comprised primarily of market-driven brands – produce the bra..
Chinese brands are digitizing rapidly, sometimes leapfrogging brands in developed markets, as digiti..
A year ago Alibaba was unknown in the West. Today it’s the most publicized example of a Chinese br..
After a period of decline, Chinese consumer trust in brands has stabilized. Trust isn’t rebounding..
During China’s rapid economic rise over the past 30 years, western consumers viewed Chinese brands.. Soon after ascending to head of the Chinese Communist Party, in 2012, President Xi Jinping articulat.. Eight brands, from five categories, appear for the first time in the BrandZTM Top 100 Most Valuable ..
Market responsiveness, rather than size or government support, today drives brand value growth in Ch.. Brand contribution measures the impact of brand alone, without financials or other factors, in the m..
1. THE ADVANTAGE GAP There are many gaps between how consumers from various countries view Chinese b..
Kow Kuanhua General Manager, Greater China Lightspeed GMI kkow@lightspeedresearch.com Identi..
David Roth CEO The Store WPP EMEA and Asia david.roth@wpp.com Chinese culture shapes brand buil..
Marcel Chu Director, Marketing Communications, Shanghai Hill+Knowlton Strategies, Chinamarcel.chu@hk..
Eden Chen Training Manager Ogilvy & Mather, China eden.chen@ogilvy.com ..
Airlines (+7%) AIRLINES IMPROVE SERVICE AS TOURISM DRIVES GROWTH Airlines enjoyed healthy growth, d..
Sophie Shen General Manager, Media and Consumption Behavior CTR CNRS-TGI shenying@ctrchina.cn ..
COMPANY Suning Commerce Group Company, Ltd. BRAND VALUE US$ 2.0 Billion YEAR-ON-YEAR CHANGE 24%�..
FIgo Yang CEO Polestar yangfei@cpjidi.com Allen Liu COO P.. Favorable factors will converge in 2015 Eden Chen Training Manager Ogilvy & Mather..
Strong concepts will drive growth as categories mature Premiumization. For manufacturers it’s freq.. But brands must shape messages for multiscreen viewing According to the China Internet Network Info..
Consumers listen to their peers The erosion of consumer trust in both Chinese and foreign brands h..
And they deliver long-term positive impact China is becoming a genuine brand land. We are now floode..
Introduction The brands that appear in this report are the most valuable in China. They were sel.. Step 1: Calculating Financial Value Part A We start with the corporation. In some cases, a corpora..
All brand valuation methodologies are similar - up to a point. All methodologies use financial resea..
Amandine Bavent Amandine Bavent is a BrandZ Valuation Manager for Millward Brown. She manages the br..
A decade ago, Chinese consumers preferred Western brands. Western brands were well known and trusted..
A decade ago, there was only one brand from China in the BrandZ™ Top 100 Most Valuable Global Bran..
59% five-year growth outpaces BrandZTM Global Top 100 This is the fifth anniversary edition of our .. Brand value increases 22 percent continuing 5-year growth tend Chinese brands have come of age. Ov..
MARKET-DRIVEN BRANDS DOMINATE VALUE GROWTH Only five years ago, the BrandZTM Top 5 Most Valuable Ch..
COMPANY Tencent Holdings, Ltd. BRAND VALUE US$ 66.1 Billion YEAR-ON-YEAR CHANGE 95%&nb..
COMPANY Alibaba Group Holding, Ltd. BRAND VALUE US$ 59.7 Billion YEAR-ON-YEAR CHANGE N..
COMPANY China Mobile, Ltd. BRAND VALUE US$ 55.9 Billion YEAR-ON-YEAR CHANGE -9% ..
ICBC focused its lending activity on sectors that expand China’s economy, including constructi..
COMPANY Baidu, Inc. BRAND VALUE US$ 30.9 Billion YEAR-ON-YEAR CHANGE 55% HEADQUARTERS Beijing IN..
COMPANY China Construction Bank Corporation BRAND VALUE US$ 21.0 Billion YEAR-ON-YEAR C..
COMPANY China Petroleum & Chemical Corporation BRAND VALUE US$ 15.5 Billion YEAR-ON-YEAR..
COMPANY Agricultural Bank of China, Ltd. BRAND VALUE US$ 15.4 Billion YEAR-ON-YEAR CHA..
COMPANY PetroChina Company, Ltd. BRAND VALUE US$ 12.0 Billion YEAR-ON-YEAR CHANGE -11%..
COMPANY Bank of China, Ltd. BRAND VALUE US$ 11.9 Billion Y EAR-ON-YEAR CHANGE -13% HE..
COMPANY Ping An Insurance (Group) Company of China, Ltd. 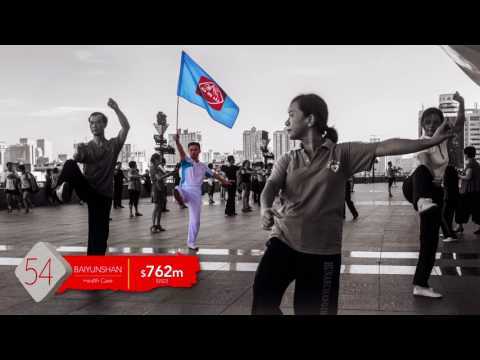 BRAND VALUE US$ 11.1 Billion YEAR-O..
COMPANY China Life Insurance Company, Ltd. BRAND VALUE US$ 10.1 Billion YEAR-ON-YEAR C..
COMPANY China Telecom Corporation, Ltd. BRAND VALUE US$ 9.9 Billion YEAR-ON-YEAR CHANG..
COMPANY Kweichow Moutai Company, Ltd. BRAND VALUE US$ 7.6 Billion YEAR-ON-YEAR CHANGE ..
COMPANY China Merchants Bank Company, Ltd. BRAND VALUE US$ 5.7 Billion YEAR-ON-YEAR CHANGE -..
COMPANY China Unicom Hong Kong, Ltd. BRAND VALUE US$ 5.5 Billion YEAR-ON-YEAR CHANGE 2..
COMPANY Inner Mongolia Yili Industrial Group Company, Ltd. BRAND VALUE US$ 5.1 Billion YEAR..
COMPANY China Mengniu Dairy Company, Ltd. BRAND VALUE US$ 4.9 Billion YEAR-ON-YEAR CHA..
COMPANY Air China, Ltd. BRAND VALUE US$ 3.9 Billion YEAR-ON-YEAR CHANGE 6% HEAD..
COMPANY Bank of Communications Company, Ltd. BRAND VALUE US$ 3.8 Billion YEAR-ON-YEAR CHANGE..
COMPANY Lenovo Group, Ltd. BRAND VALUE US$ 3.3 Billion YEAR-ON-YEAR CHANGE 26% ..
COMPANY China Pacific Insurance (Group) Company, Ltd. BRAND VALUE US$ 3.2 Billion YEAR-ON-YE..
COMPANY China Minsheng Banking Corporation, Ltd. BRAND VALUE US$3.1 Billion YEAR-ON-YEAR CHA..
COMPANY Yunnan Baiyao Group Company, Ltd. BRAND VALUE US$ 2.7 Billion YEAR-ON-YEAR CHA..
COMPANY Henan Shuanghui Investment and Development Company, Ltd. BRAND VALUE US$ 2.7 Billion&..
COMPANY China Vanke Company, Ltd. BRAND VALUE US$ 2.6 Billion YEAR-ON-YEAR CHANGE 1%&n..
COMPANY PICC Property and Casualty Company, Ltd. BRAND VALUE US$ 2.4 Billion YEAR-ON-YEAR CH..
COMPANY China Eastern Airlines Corporation, Ltd. BRAND VALUE US$ 2.0 Billion YEAR-ON-Y..
Haier entered strategic partnerships, including one with Alibaba, in which the appliance maker provi..
To maintain leadership during a period of slowing domestic beer consumption and intensifying interna..
A leading air conditioner and white goods maker and marketer, Gree focuses on building applianc..
Poly Real Estate opened 19 new projects during the first half of 2014, mostly in major markets, ofte..
China Southern Airlines concentrated on brand building and operational improvements during the first..
Midea improved revenue and profit with innovative advances in consumer appliances, both large and sm.. The Internet security company introduced several mobile search products during the first half of 201..
Letv is a streaming video site that also produces its own branded smart TV. The company planned to .. The company continued to open new properties and experience positive financial results, despite gove..
Yanghe introduced new products, expanded its international presence and developed an ecommerce busin.. In June 2014, Country Garden opened its first property outside of Asia, a residential development in..
A leader in the production and marketing of electric and hybrid vehicles, BYD benefited from governm..
Business improved significantly, around a customer centric approach to meeting customer current dema..
Tong Ren Tang launched an online medicine store during 2014, selling Tong Ren Tang over-the-counter .. Both accommodation and transportation booking increased substantially during the first half of 2014,..
New Oriental established an online education joint venture with Internet giant Tencent. The venture.. Mobile games, advertising and ecommerce contributed to NetEase’s positive financial results, w..
A leading Internet portal and media company, Sina conducted an IPO (Initial Public Offering) of Weib..
A maker of telecommunications equipment and systems, ZTE focused on developing new opportunities in ..
Several Bright Dairy initiatives sought to ensure an adequate supply of milk at reasonable cost and ..
ChangYu shifted its promotion focus to less expensive wines and brandies, in reaction to declining c.. Snow Beer volume increased 5 percent during the first half of 2014. Promotions and capacity drove gr..
Harbin Beer used its official sponsorship of the FIFA World Cup to build its profile and market shar..
Wu Liang Ye is looking overseas for sales growth as the domestic demand for baijiu, the traditional .. The company focused on building and unifying its many brands under a collective strategy, and engagi..
Dabao introduced new packaging designed to be more stylish, modern and youthful. The renewed look pr..
dThis well-known footwear, sportswear and apparel retailer, with over 19,000 stores in mainland Chin..
CR Sanjiu sponsored the first season of one of China’s popular reality shows, “Wher..
Luzhou Laojiao lowered the price of its premium baijiu, Guojiao 1573, and launched three new mid- ra..
Hainan Airlines introduced non-stop service between Beijing and Boston, an important destination bec.. In a bold initiative that places the brand center stage globally, jewelry retailer Lao Feng Xiang pr..
One of China’s earliest car brands, Great Wall is best known for its popular SUV models. It sp..
Longfor experienced strong property sales and rental results during 2013. As the real estate market ..
Industrial Bank focused on enhancing its brand image, one of the bank’s five transfo..
Gemdale adjusted its residential product offering to appeal more to first-time homebuyers, base..
Robam focused on expanding its sales channels, which include specialty stores, TV shopping, architec.. In an effort to strengthen leadership of the budget hotel segment, Home Inn has been adding hotels a..
Yanjing Beer continued to focus on increasing sales of its mid- range beers and its distribution in ..
A leading hypermarket chain, Yonghui Superstores agreed to sell a 20 percent stake in the compa..
R&F Properties entered its first joint venture outside of China, with a large land purchase in J.. The company launched a new business called Sanquan Fresh, which integrates online ordering and offli.. Sales growth in ecommerce and children’s products drove strong profit improvement, following a..
Demand for prime office space in Beijing and Shanghai drove Soho China’s strong sales and prof.. Jewelry retailer Eastern Gold Jade introduced new jade products and expanded its presence in fi.. Known as a maker and marketer of bedroom wardrobes, Suofeiya opened the first of an estimated 1..
As government restrictions on extravagant official entertainment continued to depress the baijiu ind..
China Everbright Bank was listed on the Hong Kong Stock Exchange in December 2013, a development tha.. The China Lodging Group operated 1,669 hotels in 270 cities at end of the first half of 2014, and ov..
Pearl River accelerated its effort to claim leadership in the premium beer sector. While marketing i..
A fashion shoe brand, Tata is styled for young urban women. It’s one of the footwear brands ow..
Quanjude streamlined its menu, redesigned the layout of some of its restaurants and focused expansio.. The home appliance company introduced innovative smart technology and energy-saving features to driv..
A leading cooking oil brand, Fortune initiated several marketing campaigns to drive sales and reinfo..
Greentown China planned to sell a minority stake of about 24 percent to Sunac China, ..
Ming Jewelry added 18 company- operated stores and 64 franchise locations during the first half .. Rapid increase in mobile use, driven in part by the launch of the Tencent WeChat search function, pr..
A leading cookware manufacturer, Supor recently built facilities for producing stainless steel and c.. The company gained additional profit when it acquired all of the insurance- related businesses from ..
A maker and retailer of men’s apparel, Youngor focused on product innovations that c..
Zhong Hua launched a new marketing campaign with a slogan that connected the power of a bright smile..
China Overseas Property, which focuses primarily on building premium residential projects, opened it..
A provider of after-school tutoring services, Xueersi opened more locations, reaching its current go..
To meet the changing expectations of customers who increasingly book their transportation and a..
Reservations made on the Jinjiang Inn website increased 86 percent during the first half of 201..
An online grocer, in which Walmart owns a majority share, Yihaodian expanded its product range and s.. In acquiring major stakes in children’s education companies, Semir initiated a strategic shift..
Septwolves focused on design innovation, inviting three international designers to create distinctiv..
TCL Multimedia announced a strategic transformation from product maker to provider of multimedi..
Yonghe King focused on improving customer satisfaction in its fast food restaurants and refining its..
Yashili enhanced its marketing strategy with a membership program designed to learn more about custo..
Insurance (-10%) Insurance brands added agents and strengthened various selling channels in an effo.. Jewelry Retailer (-2%) Jewelry retail continued to benefit from China’s growing affluenc..
Oil and Gas (+4%) Along with slower economic growth, political forces pressured a category consider.. Personal Care (+4%) The personal care category continued to expand, reflecting the interests and th..
Real Estate (0%) To rebalance the economy, and avoid a real estate bubble, the government slowed ho..
Retail (+3,827%) The BrandZTM Top 100 Most Valuable Chinese Brands2015, includes four retail brands..
Technology (+78%) Technology surpassed banks this year as the category contributing the largest sha..
Telecom Providers (-4%) Consumer adaption of mobile drove the telecom provider category. Mobile sur..
Of the 21 product and service categories tracked in BrandZTM Top 100 Most Valuable Chinese Brands, 1..
Alcohol (-22%) BAIJIU BRANDS PURSUE NEW STRATEGIES TO STIMULATE DEMAND Demand for baijiu continued..
Apparel (-37%) FOREIGN COMPETITORS ADD TO PROBLEMS OF SLOWER GROWTH Many Chinese sportswear brands..
Banks (-16%) The banks category adjusted to a combination of pressures that negatively impacted res..
Travel Agencies (+48%) Leisure travel continued to drive category growth, even as business travel s.. Catering (+18%) More consumers are dining in restaurants as part of the Chinese middle class experi..
Education (+57%) The education category continued to benefit from a cultural commitment to learning..
Furniture (-1%) The furniture industry benefited from urbanization and household formation. The gro..
Home Appliances (+20%) In an unfavorable climate of higher interest rates and slower real estate de..
Hotels (0%) Although hampered by slower economic growth and reduced government business travel spen..
Rebekah Pothaar APAC Digital Strategist Blue Hive, Asia Pacific rebekah.pothaar@thebluehive..
Jeff McFarland Director of Strategy Landor Associates, Greater China jeff.mcfarland@l..
Saurabh Sharma Head of Planning Ogilvy & Mather, Beijing saurabh.sharma@ogilvy.com&..
Peter Mack Executive Director Landor Associates Greater China peter.mack@landor.com&n..
Michael Smollan CEO Smollan, China smollanm@smollan.co.za We know the consumer..
Peony Wu Chief Digital Officer Ogilvy & Mather, China peony.wu@ogilvy.com ..
Simon Li General Manager Kantar Health China simon.li@kantarhealth.com Traditionall..
Mark Englehart Evans Senior APAC Digital Strategist Blue Hive, Asia Pacific mark.evan..
Shuang Xu Director of Corporate and Public Affairs Burson-Marsteller, China sh..
Gannon Osburn APAC Campaign Planner Blue Hive, Asia Pacific gannon.osburn@theb..
Jason Yu General Manager Kantar Worldpanel, China jason.yu@ctrchina.cn Slower ..
Dan Ingall Managing Director JWT, Shanghai daniel.ingall@jwt.com Innovation has..
Douglas Dew Practice Leader of Public and Corporate Affairs Burson-Marsteller, China ..
Monica Lee CEO Greater China Brand Union monica.lee@brandunion.com China creates pol..
Panos Dimitropoulos Account Director, Cultural Insight Added Value, Shanghai p..
Michael Zhang Strategy Officer GroupM, China michael.zhang@groupm.com To buil..
China 2015: INSIGHTS | Spotlight on Digital..
Luo Xiaoting Senior Vice President Hill+Knowlton Strategies, China l..
China 2015: INSIGHTS | Spotlight on Digital. Zita Wang Digital Account Director Cohn&Wolfe zita.wang@cohnwolfe.com Data..
Yi Li Consulting Director, Insights and Analysis OgilvyOne yi.li@ogilvy.com&nb.. Marketers need to mind the gap For Brand China, the challenge to move up the value chain and create..
Health Care (+1%) Health care reform and heavy competition were among the factors that slowed value..
Joe Peng National Digital Practice Leader Burson-Marsteller, China joe.peng@bm.com D..
Metersbonwe launched a three-year store remodeling program aimed at strengthening its market positio..
Airlines (+7%) AIRLINES IMPROVE SERVICE AS TOURISM DRIVES GROWTH Airlines enjoyed healthy grow..
Cars (+141%) China’s car industry continued steady growth. Passenger car sales rose 10.2 pe..
Food and Dairy (+14%) Food and dairy brands launched initiatives to address the category’s ..